Heinrich Luitpold Himmler, 1900-1945. Nazi Reichsführer-SS; Chief of the German Police; Minister of Interior, 1943-1945. 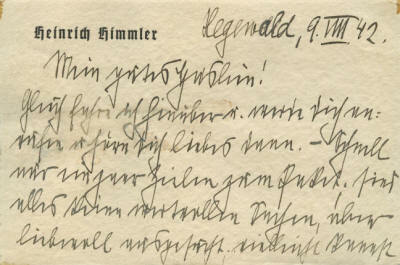 Excellent dual association Autograph Letter Signed with an asterisk, *, two pages (front and back), 4½" x 6¾", on Himmler's imprinted personal note stationery, Hegewald, [Ukraine], August 9, 1942. 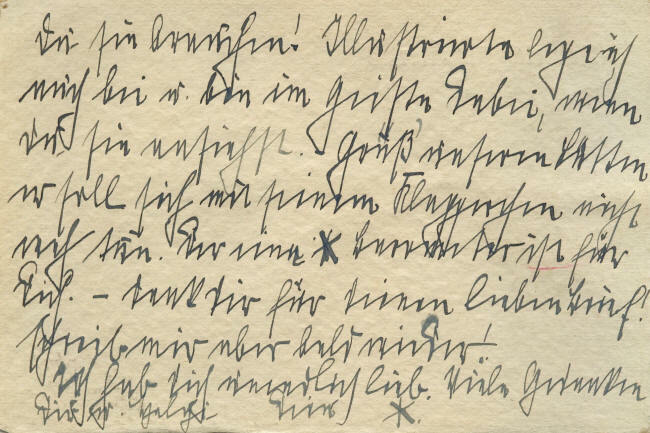 At the same time that he is planning a brutal displacement of native Ukrainians, Himmler writes a warm, loving cover letter to his mistress to send her a package (not present). In full: ”Hegewld, 9. VIII 42. My dear little bunny! I’m about to drive over and will call you and hear your dear voice. Quickly just a few lines regarding the parcel, they are all without value but chosen with love; perhaps you can use them! An illustrated magazine is also enclosed and I’ll be with you in spirit when you look at it. * Say hello to our sweet one; hope he does not hurt himself with his rattle. The barometer is for you. – Thank you for your dear letter! Write again soon! I love you forever. Many thoughts of you and Walchi. Your *." Himmler was married but nevertheless began a spiritual and sexual relationship with his secretary, Hedwig Potthast, in 1940. Known familiarly as H�schen, or “young hare,” she was 12 years younger than Himmler. She bore him two children out of wedlock—a son, Helge, whom he mentions in this letter, in 1942, and a daughter, Nanette Dorothea, in 1944. This letter also has ties to Himmler's dark side. He wrote it from Hegewald, his SS field headquarters near the Ukrainian capital of Kiev, where at the time he was planning the brutal removal of native Ukrainians in order to colonize and repopulate the area with Germans. He had established a small trial colony, and on October 10, 1942, SS troops began the purge of 10,623 Ukrainian men, women, and children, forcing them into trains headed for labor camps farther south. 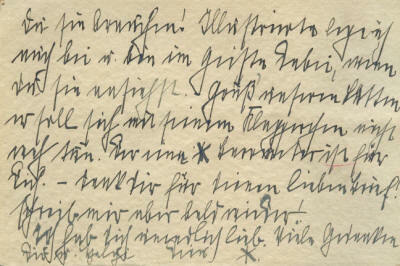 The letter was confiscated from Himmler's mistress while she was being interrogated during the summer of 1945. It is boldly written in black fountain pen in Himmler's pointed, angled script on his cream-colored, textured personal stationery. There are a couple of chips in the upper corners, affecting nothing, and a small area of apparent damp staining, affecting a half dozen words, on the front side. These do not detract from the overall quality of this piece, which is in very fine condition overall. While we reject Nazism, we offered this piece because of its absolute rarity and importance and because of the substantial role that the German Third Reich played in 20th Century history.